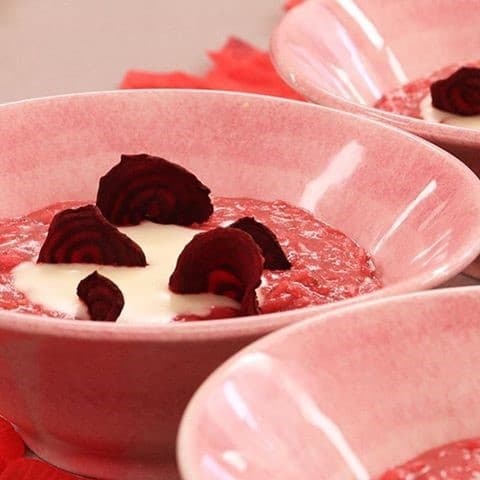 RED BEETS RISOTTO FROM JAMIE OLIVER IN OUR PINK FLOWER BOWLS! A nice recipe belongs to valentine! Valentine is the day to express a love to your loved one with a tasty recipe or to prepare a special meal for your friends. A suitable Valentine’s recipe can not be missing here. Especially for Valentine 2019 this pink version of Jamie Oliver risotto in our pink flower-shaped dishes. Wash the red beets well and dry them. Rub them with olive oil. Place the beets on a baking dish, sprinkle with salt and roast in an oven (175 ° C, 75 minutes). Let the beets cool down, remove the skin and cut the beet into pieces. Add the risotto list. Extinguish the rice when it is glassy with the white wine. Let the wine evaporate. Add a little stock until the risotto is half cooked. Keep stirring regularly. Add the beetroot and let the rice pass for 3 minutes. Now add lemon juice and olive oil to taste, goat cheese and butter. Cover the pan with a lid and let the risotto rest briefly. Stir in the risotto once more. Serve with grated Parmesan, olive oil and possibly some crispy breadcrumbs and sliced ​​mint in our light pink and pink flower-shaped dishes. As an extra a green salad served in our large light pink oyster bowl.